Jupp Heynckes has returned to Bayern Munich once again to fill the void left by Carlo Ancelotti's departure, settling into a familiar role as first-team boss at least until the end of the season. 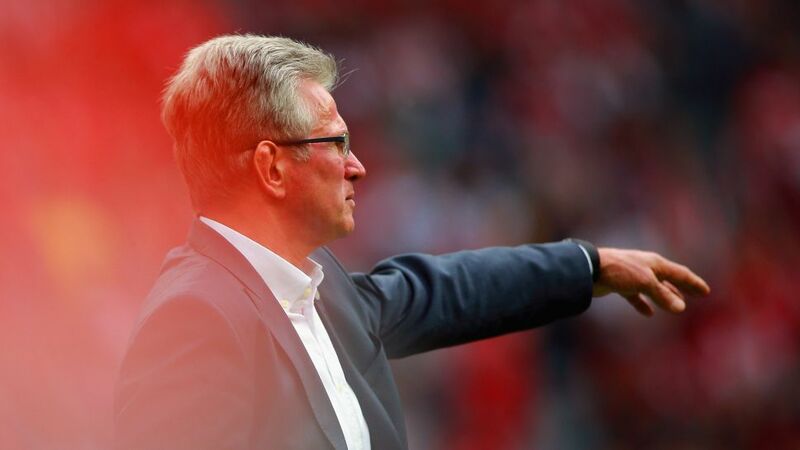 Let bundesliga.com paint a picture of a man who has left an indelible mark on German football as a player and a coach in over half a century in the game. 1) May the fourth be with you…. This is Heynckes' fourth spell in charge of Bayern. The first, between 1987 and 1991, brought two Bundesliga titles and two runners-up finishes — he appears to have forgiven Uli Hoeness for giving him the sack in October '91. He salvaged Bayern's 2008/09 season, stepping in after Jürgen Klinsmann's removal in April 2009 to win four of the club's five remaining league games and finish second to secure Champions League qualification, something that had looked beyond Bayern's reach when he took over. The third, in which he led Bayern to an unprecedented treble of Bundesliga, DFB Cup and Champions League, was his most glorious, and also thought to be his last. "After everything that's happened over the past two years, I'm ready for some peace and quiet," he told German media in 2013. "I have a problem with the finality of saying 'never'. But I can assure you that I have no intention of coaching again. I had a worthy ending." At least you never said 'never', Jupp. Born in Mönchengladbach the ninth child of ten and the son of a blacksmith, he initially learned to be a plasterer and harboured ambitions of becoming an architect before making football his career. He never lost the connection to Mönchengladbach, though, and still lives with his wife, Iris, on a small farm outside the Nordrhein-Westphalian city of which he, former team-mate Günter Netzer and Barcelona goalkeeper Marc-Andre ter Stegen are the most famous sons. Fittingly, what everyone thought would be his final Bundesliga match in charge of Bayern in May 2013 was at Borussia-Park. "It showed where my home is," Heynckes said after receiving an emotional ovation from home and away fans alike after Bayern's 4-3 Matchday 34 win. That, and that season's treble — making him one of eight men alongside the likes of Guardiola, Jose Mourinho and Sir Alex Ferguson to achieve the feat in European football — looked to be the sort of perfect swansong even Hollywood would have struggled to cook up. Instead, it was just the end of a chapter. Heynckes is a renowned coach, but before that he was quite a player for his hometown club. A three-year spell at Hannover between 1967 and '70 aside, Heynckes was a Foal for his whole playing career. He netted a gobsmacking 195 goals in 283 Bundesliga matches for Gladbach, and his 220 career strikes put him third on the all-time list for the German top flight behind Bayern's incomparible Gerd Müller and the prolific Schalke marksman Klaus Fischer. 4) Can he do it outside Germany? Silly question! Of course he can. After stepping off the pitch, he first stepped into the dug-out at Gladbach, and after his first stint at Bayern, he moved to Athletic Bilbao for the first of five adventures on foreign soil. Following in the footsteps of Hennes Weisweiler and Udo Lattek, the only two German coaches to have worked in La Liga before him, Heynckes polished up their legacy by taking Bilbao to UEFA Cup qualification in his second season; he did the same in his first season in Tenerife (95/96) and then lost to Schalke in the semi-final of the competition the following campaign. That was enough to convince Real Madrid 'Don Jupp' could be a success at the Santiago Bernabeu. He was, winning the Champions League, but fourth-place in La Liga meant he lasted just one campaign. Benfica and Bilbao again followed before he took over at Schalke in 2003. Ahead of the Champions League 2012/13 semi-final encounter with Barcelona, Heynckes was asked whether he would be asking Pep Guardiola, former Barca coach and already confirmed as Don Jupp's successor at Bayern, for tips. "If I wanted to call someone up, I'd choose Johann Cruyff, because he's the man who invented the Barcelona system," an irked Heynckes responded. "But I don't need that anyway." One 7-0 aggregate triumph followed by a final win over Borussia Dortmund, you have to say he was right. The media are not the only ones to sometimes feel the sharp end of his tongue. Franck Ribery described him as having "a big heart" but also being able to "dish out a slap". Toni Kroos, who played under Heynckes at Bayern and Leverkusen, once came back from summer holiday overweight, and learned the hard way. "It's not a mistake you make twice with him," noted the Real Madrid midfielder. Quiz: How well do you know Heynckes?